Fear is an emotion we all experience. Our pets experience fear and anxiety, too. There are even more things to be afraid of for them, though. Dogs don’t understand that the loud booming they hear is only harmless fireworks, or that the person that brings the mail every day is a friend, not a foe. Keeping your dog calm during upsetting circumstances can be a challenge. It’s now possible to use the safe, pleasant treatment of aromatherapy as a quick way to ease your pet’s stress. Is dog anxiety medication the best solution? Dog anxiety medicine can be helpful in extreme cases but should be used with caution. If your pet is currently on other medications, anxiety medication for dogs may result in drug interaction that could be dangerous. This is especially true if your dog’s current medication alters the natural serotonin level. In the majority of acute cases of dog anxiety caused by noise or a disruption in the normal routine, natural remedies and solutions are the best choice. If your dog suffers from continuous separation anxiety, a professional dog trainer can help teach your dog how to cope with the stress of being without you for extended periods of time. Do your neighbors complain about your dog’s constant barking while you’re away? Separation anxiety is likely the cause. Although it may be difficult, consciously make an effort not to show too much emotion when you are leaving or when you come home. When you greet your dog with too much attention and affection, it actually may act as a reward for any barking or bad behavior while you were out. Similarly, if you act sorry or sad that you have to leave your pet, your behavior can become the anxiety trigger. Give your pet something to do that will capture his or her attention during an upsetting or disturbing event. Offering your pet a favorite dog toy (especially one that dispenses treats) can occupy the mind and channel anxious energy in a positive direction. Using a safe, comfortable crate can keep your pet from pacing or indulging in destructive behavior like chewing up shoes or sofa cushions. Once your pet becomes accustomed to staying in a crate, it provides a sense of safety and private space that can help ease anxiety and chaotic feelings. Make sure your pet gets plenty of exercise and scheduled playtime with you on a regular basis. Going for a walk, run or swim prior to an anticipated stressful event can help get rid of pent-up energy and put your dog in a relaxed physical and emotional state. The makers of the popular Thundershirt dog anxiety vest, have introduced ThunderEssence, an innovative aromatherapy product to ease dog anxiety. ThunderEssence is a safe, pleasant way to quickly dial down your pet’s anxiety level and induce a feeling of tranquility even in stressful situations. It’s great for use during fireworks, thunderstorms and vet visits. ThunderEssence is made with natural essential oils prized for centuries for their soothing and calming properties. The gentle yet effective blend of Lavender, Chamomile, and Egyptian Geranium oils helps to relax pets and ease anxiety. 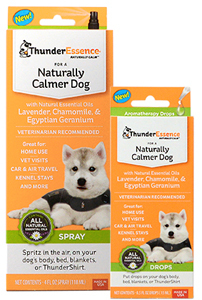 Unlike strong dog anxiety medication, ThunderEssence calms without sedating your pet. Available in both spray and drops, this simple anxiety solution for dogs can be used on your pet’s bedding, a favorite toy or even directly on your pet. It is also ideal to be used along with the Thundershirt as an added layer of stress relief. ThunderEssence is pH balanced and completely free of dyes and parabens. It’s perfect for use in the home, car, kennel or crate to give your pet a feeling of peace and tranquility. Keep a bottle close at hand to quickly and safely soothe your pet’s worried mind anytime. A quick spritz of great smelling ThunderEssence can help get rid of bad odors like that “wet dog smell”, too! Would your dog benefit from the relaxing aroma of ThunderEssence? 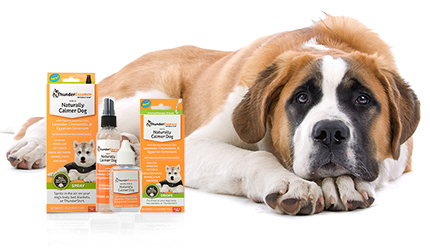 Just leave a comment below telling us about your anxious pup for a chance to win FREE ThunderEssence from 1800PetMeds! One winner will be chosen at random on Wednesday, March 9, 2017, so everyone who participates has a chance to win! (Limited to residents of the U.S.) Good luck! Congrats to the drawing winners: Bonnie B (ThunderEssence Spray) and Janeen C (ThunderEssence Drops). We’ll send you an email with instructions for claiming your prize. I would love to win this and try it on my Puggle named Buster. I’ve had him since he was 9 months old (he’s almost 10 years old now) and initially thunderstorms did not bother him. Now he is so scared of thunderstorms and has anxiety attacks whenever they occur. He also is not fond of riding in the car – that also causes anxiety attacks. And if the car ride is more than 20 minutes, he usually throws up. So this limits his trips to dog parks and doggie play dates. We just recently had a thunderstorm – one of my girls, went in the bathroom by herself (no lights on) and began to pant on the rug! I would love to see if this would help her!! Thanks!! This would be such a blessing for my fur baby! He gets so incredibly scared when it storms out that he can’t stop shaking & crying thru the entire storm. He tries climbing on my lap to get some sort of comfort. My heart breaks seeing him go thru this. Our big fur baby Captain definitely needs to try ThunderEssence! Every storm that passes through has him tucking his tail and hiding! Worst possible time for Captain is in late April, We live in Louisville Ky. and have our annual Thunder over Louisville! All of the jets flying over and the boom from the fireworks has him a nervous wreak! We have tried multiple products but haven’t had any success! Even if we don’t win this giveaway, We’re definitely going to try ThunderEssence. Hopefully it’s the miracle we’ve been searching for! My little Pepsi needs something like this. His anxiety gets so terrible most days. I always wished there was something I can do for him. This would be a great solution! I have 4 out of 6 dogs that could really benefit from ThunderEssence..They panic to extreme when they hear the slightest noise from a gun or fireworks ..Especially thunder.They climb all over me and are trembling,panting and just totally out of control.Sometimes I think they will have a heart attack if the thunder does not stop.There is absolutely no rest for me on a thunderstorm day or night.Panic is a mild word when it comes to my dogs behavior.I have tried about everything on the market.So far..I have found nothing that helps.This product would be a lifesaver for me if it helped ! Sincerely a very stressed owner with summer thunderstorms on the way !